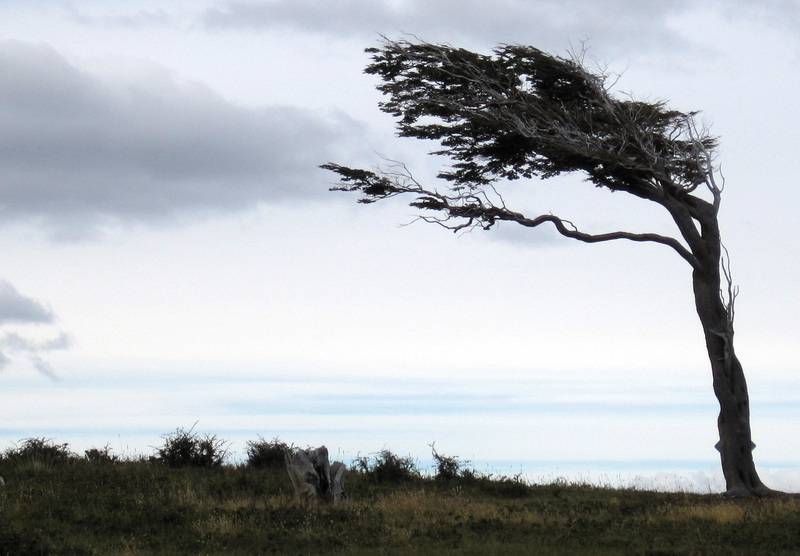 The wind shapes everything in Patagonia. We enjoyed three days in Salta before we hopped on a comfy overnight bus to Cordoba, which is Argentina’s second city. I calculated that over the past few weeks, since Lima, we’ve been on buses for 67 hours! For a few days we enjoyed sightseeing in Cordoba and really just the joyous feeling of not having to sleep upright in a seat while swaying back and forth. 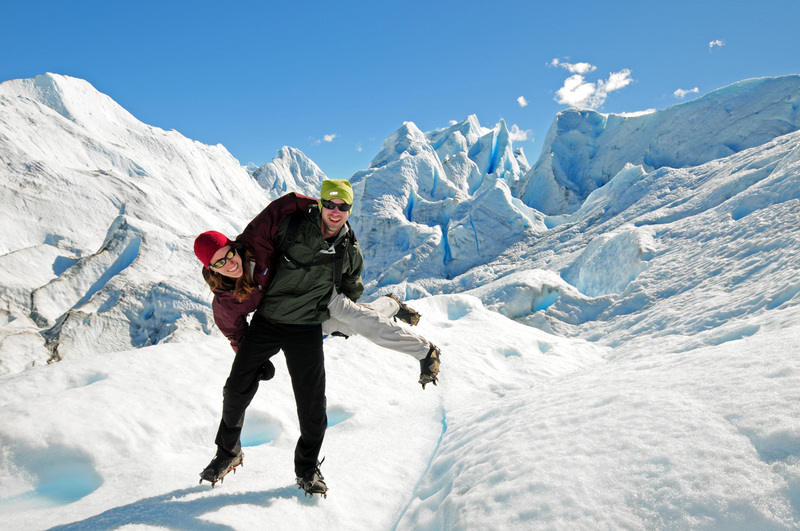 We also geared ourselves up for our next destination: Patagonia! On March 12th we took a quick flight from Cordoba to Buenos Aires, and then another from BA to the very bottom of the continent: Ushuaia! The brothers Von Fange (Jesse & Steve) were planning to meet us down there and they arrived on March 13th in the Southern most city in the world. With great excitement we met them at the airport and quickly plotted out our two-week Patagonian adventure over lunch and beers at a pub. 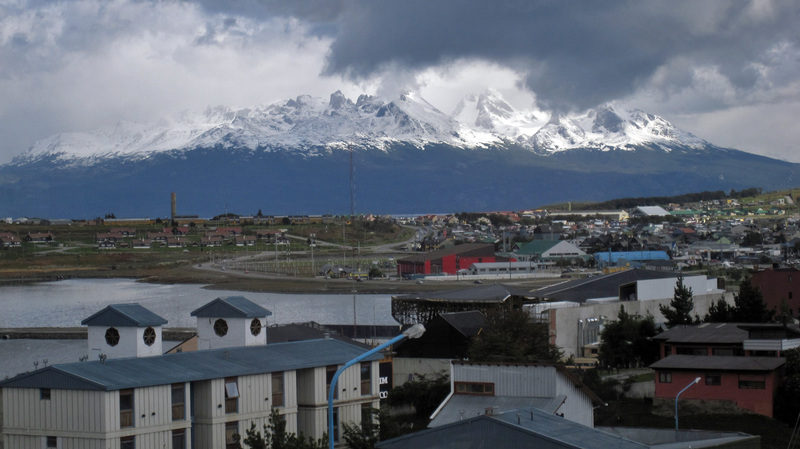 We had reserved a 4 bunk room at a nice hostel with fine views of Ushuaia and the harbor for our stay there. It turned out to be a nice place, except for the non-stop reggae music for the Rasta wanna-be behind the desk. 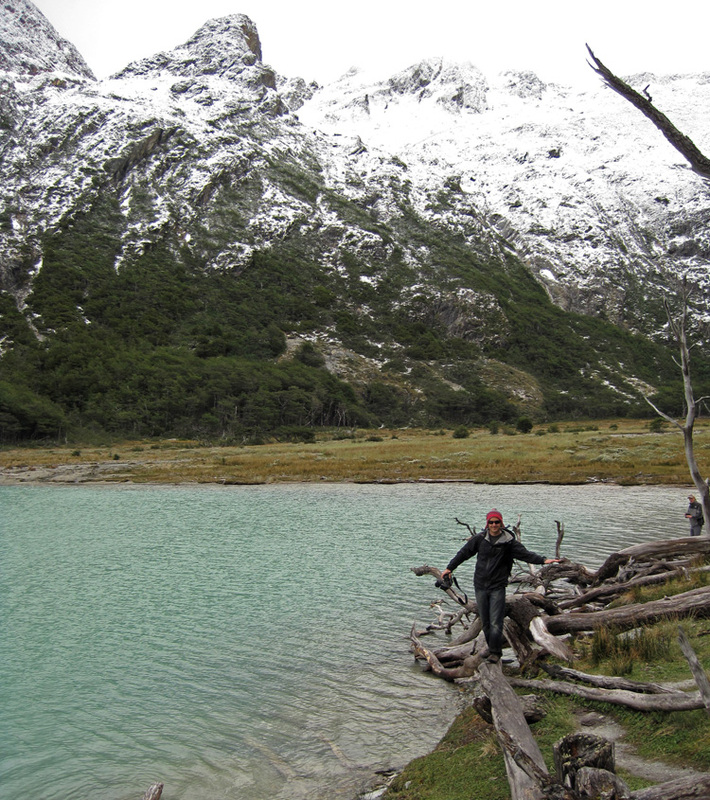 First thing on the agenda was a day hike just outside of Ushuaia to Lago Esmeralda (Emerald Lake). We piled into a taxi for the twenty-minute ride to the trailhead, which turned out to be harder to find than we thought. 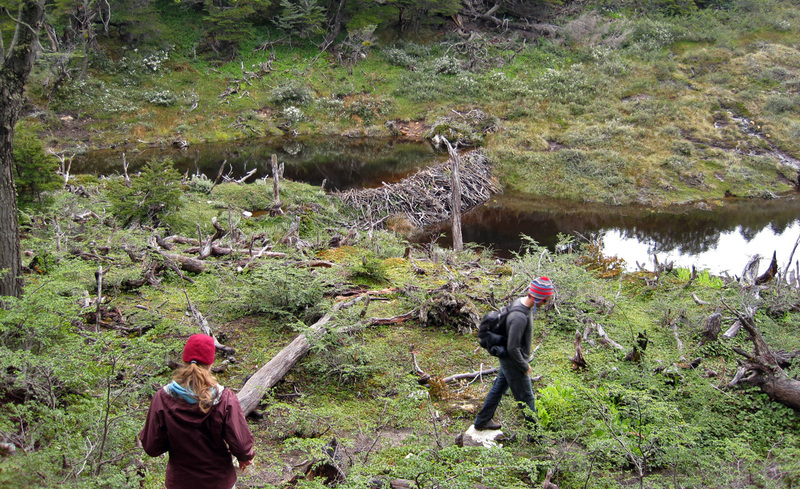 The taxi dropped us off at a different spot than we had expected, so we had to do some route finding on the first half of the hike that left us a little muddy from the swampy marsh land that we had to cross. Caro performed a graceful swan dive into a muddy creek about five minutes into the hike, but it didn’t really matter since we were all soaked in mud soon after that anyway. 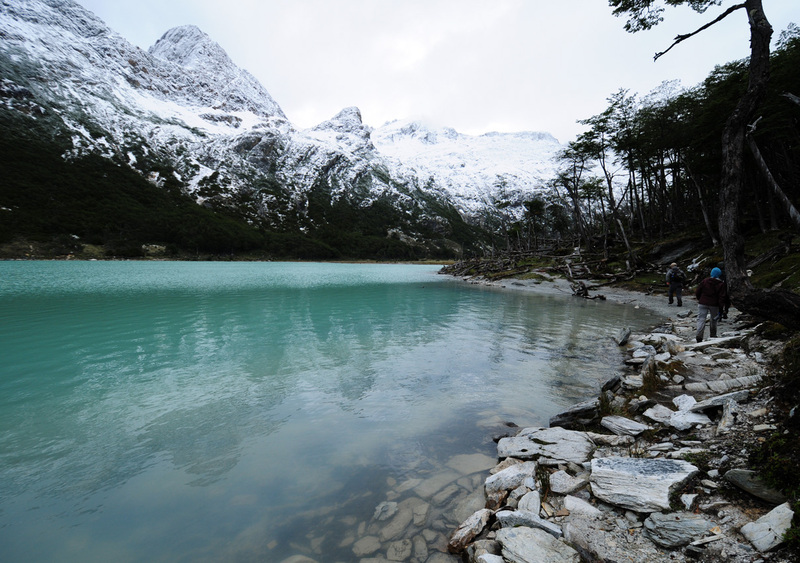 We finally found the real trail and took a stroll around the beautiful blue lake surrounded by snow-covered peaks. Steve decided that the cold wind and sleet was perfect weather for a dip, so he stripped off his layers and dove on in. It reminded me of the time that my good friend Matt Jackson took a swim in a similar glacial lake in Nepal, he couldn’t stop shivering for an hour after that. I think this lake wasn’t quite as bad – Steve seemed fine after a few minutes. 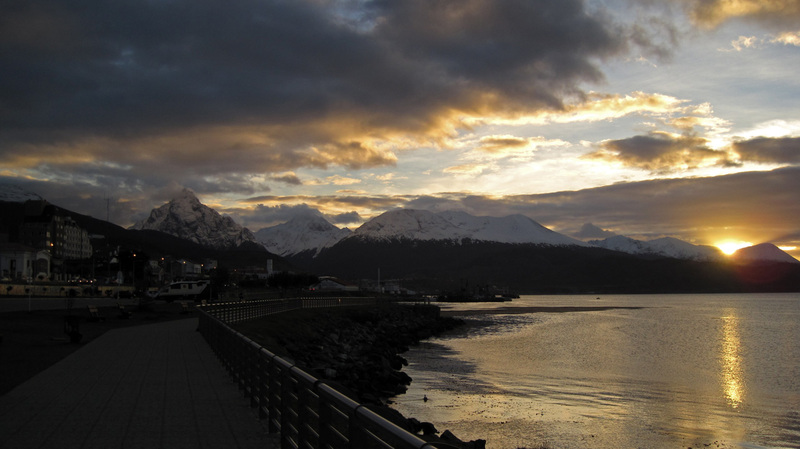 Ushuaia is a really cool town, sandwiched between the Beagle channel and snow-capped mountains reminiscent of the port towns of Alaska. It is also the jumping off point for cruises to Antarctica, an expensive but tempting adventure. Maybe next time! 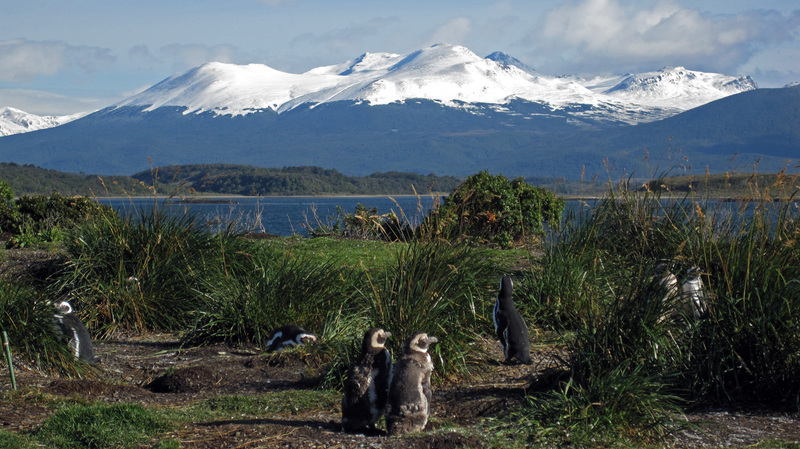 Ushuaia sits in between snow-covered mountains and the Beagle Channel. 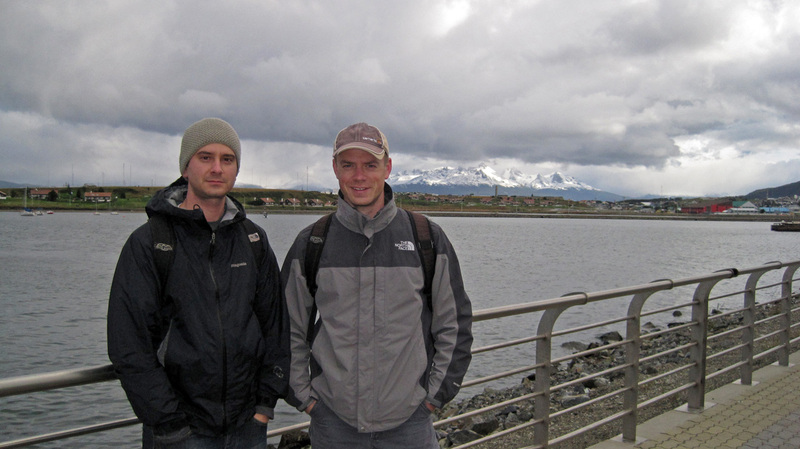 The brothers Von Fange on arrival in Ushuaia. There were lots of beaver dams on the hike to Emerald Lake, the beavers are an introduced and invasive species with few predators. We had decent weather with a few breaks in the clouds, but always cold. Jesse at the Emerald Lake. Steve takes a quick dip. 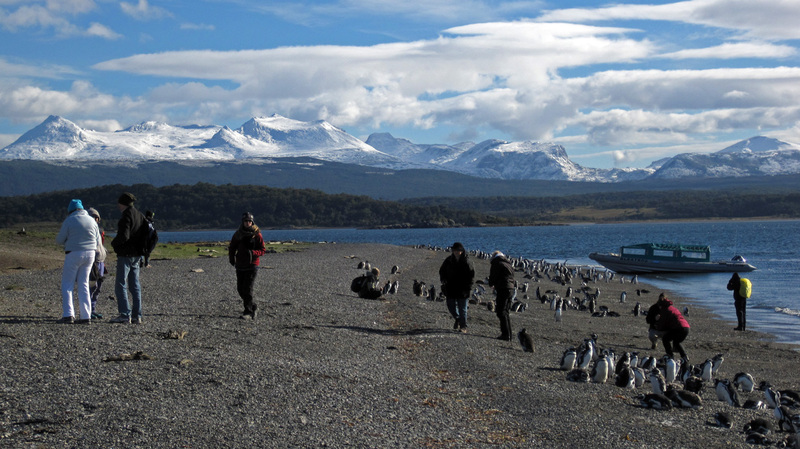 We arrived on Penguin Island just in time, they will soon depart for their long journey to Antarctica. The Penguins nest up in the hills off the beach which is semi protected from the wind. 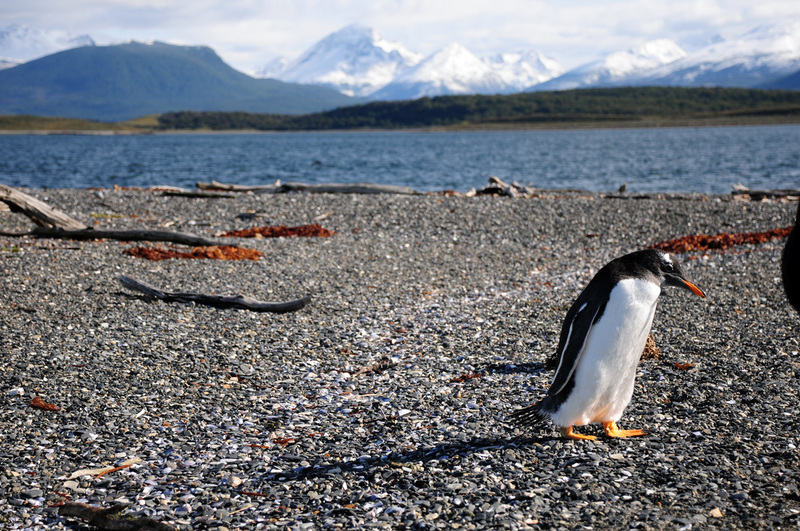 A Gentoo Penguin. By Jesse. 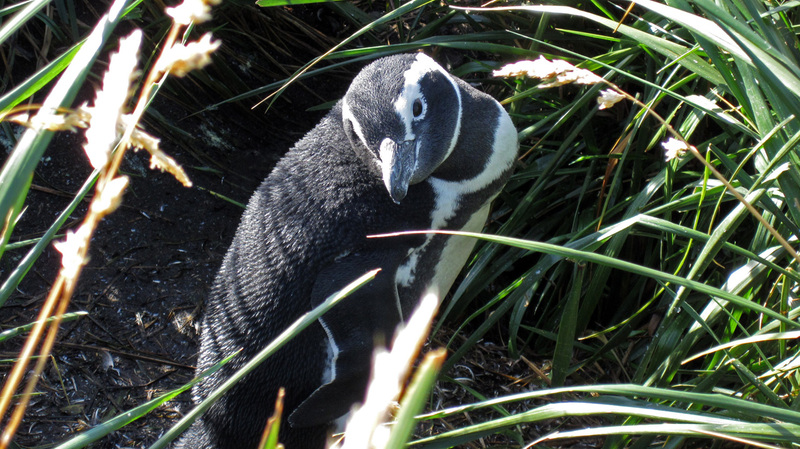 A Magellen Penguin near its nest. 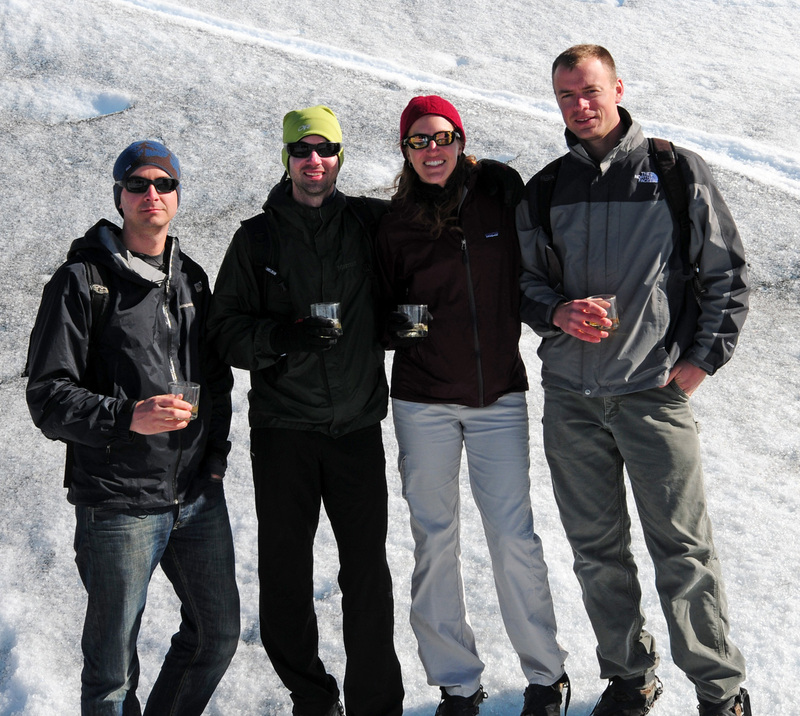 We all caught a quick flight from Ushuaia to El Calafate on March 16th. 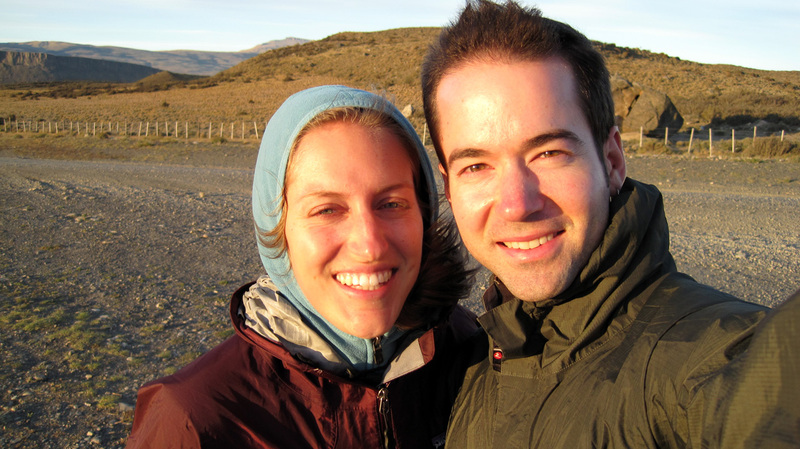 When we landed in Calafate the wind nearly took us off our feet at the airport. 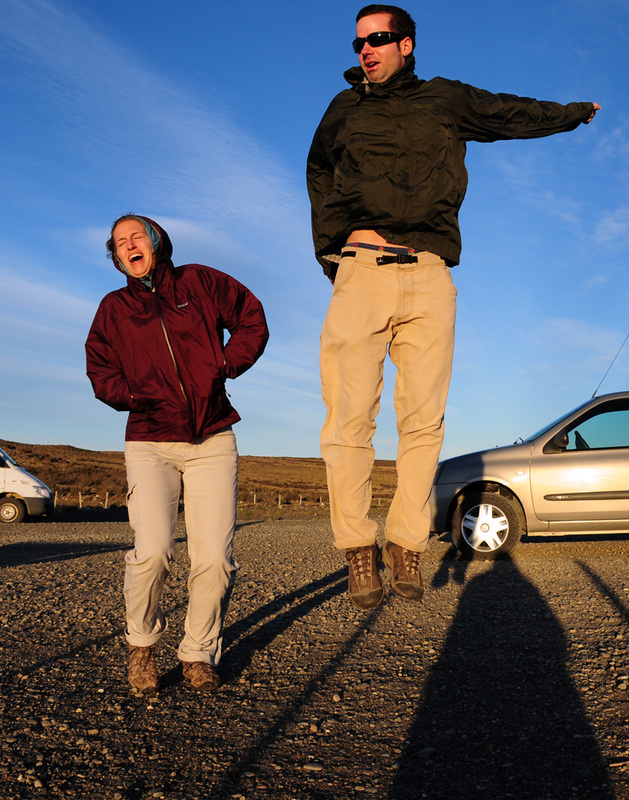 We rented a car in town and headed off to Chile and Torres del Paine National Park that afternoon. We found a refugio which was very nice, but extremely expensive. Had we known we would have rented a tent and brought more food with us! 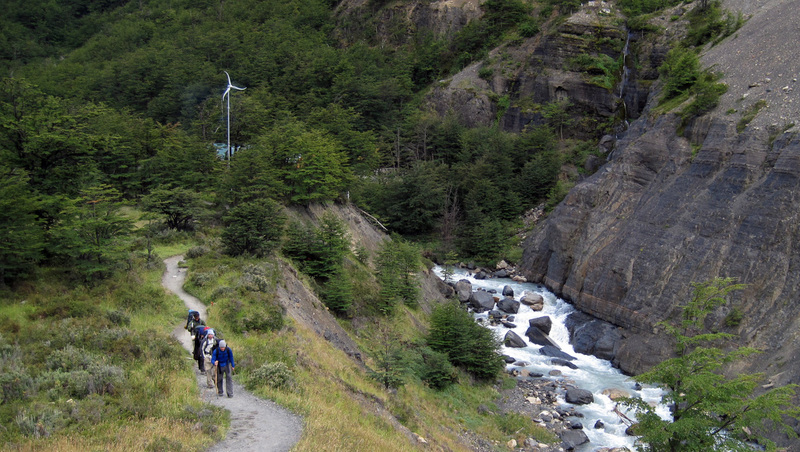 In general Chile was very pricey, but worth it for the great hike and perfect conditions. 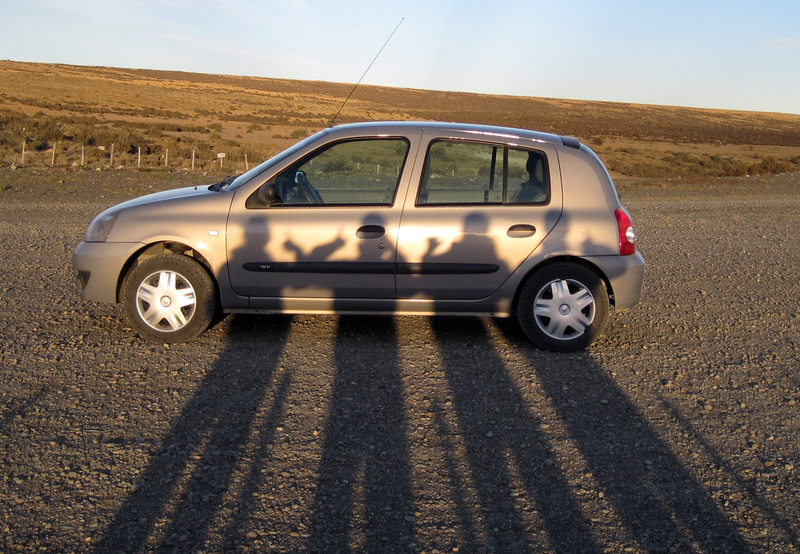 We rented a sweet little Renault which just fit the four of us and our packs. Being wind blasted on the road to Torres del Paine NP, Chile. 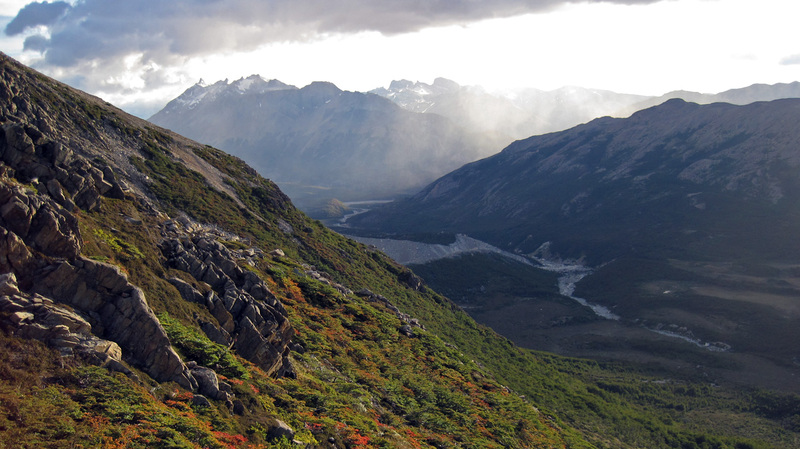 Starting up the valley in Torres del Paine, Chile. 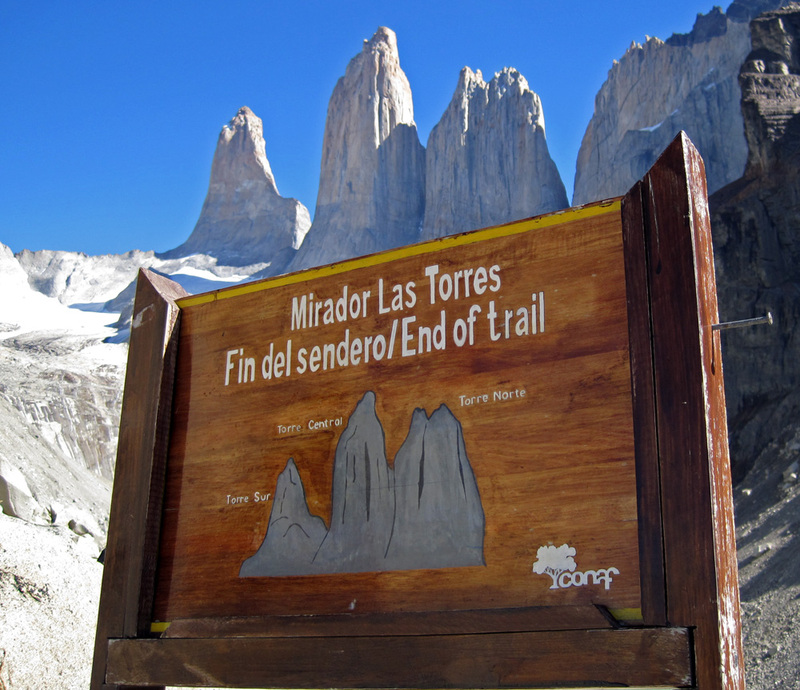 On the trail to Mirador Las Torres. A great perspective on Torres del Paine. We really lucked out with clear skies on most of our hikes. The drive out of the park was full of wildlife, we saw at least ten of these eagles along the road that morning. 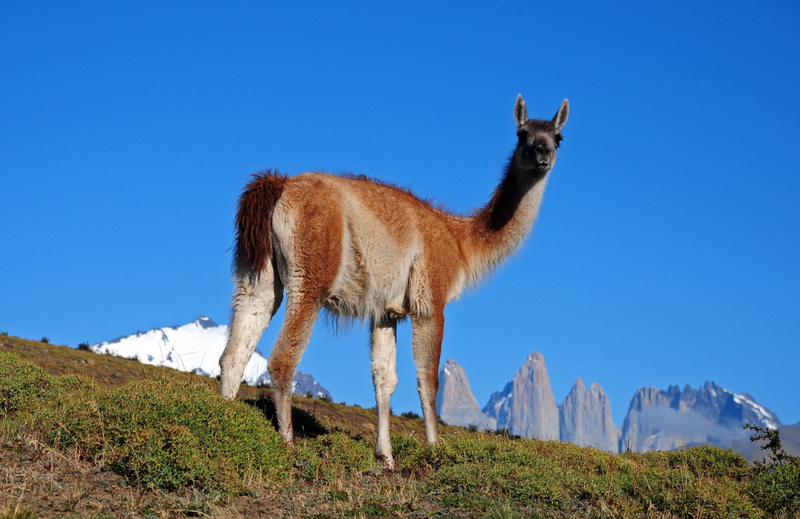 Llamas were all over the place, this one happened to be in just the right spot with the Torres in the background. By Jesse. 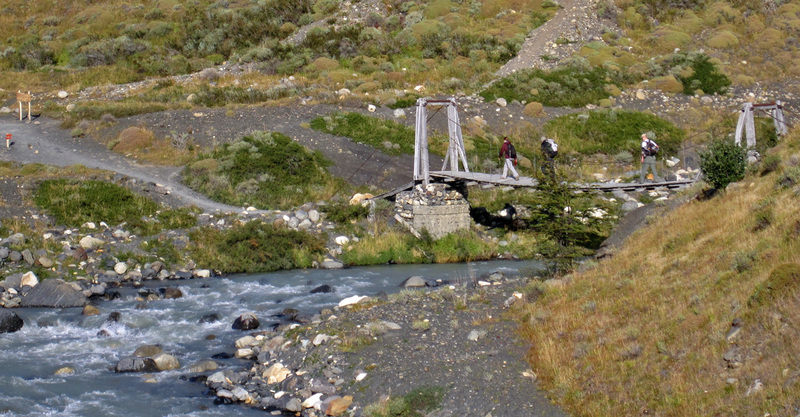 After two nights and one big hike in Torres del Paine, we crossed back into Argentina and drove back into El Calafate. 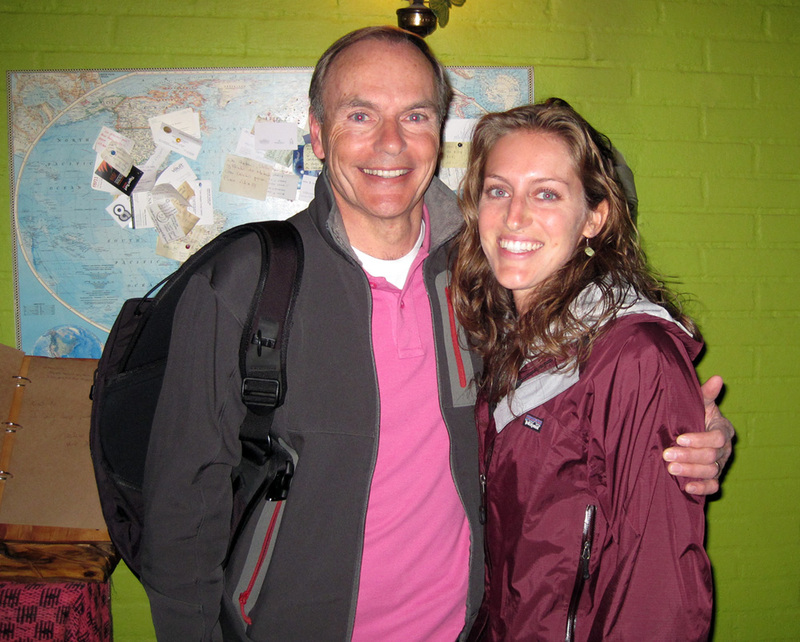 Our timing was perfect as Caroline’s Uncle Louis happened to be in town also on a Patagonian trekking trip. He took us all out for a great dinner at Pura Vida, a fantastic restaurant in town. 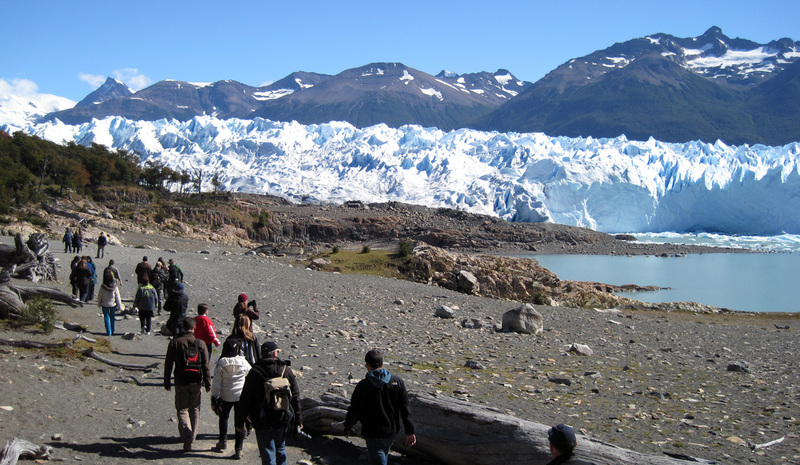 The next day we booked a ‘mini-trekking’ excursion to the Perito Moreno Glacier in Glacier National Park, an hour drive from Calafate. 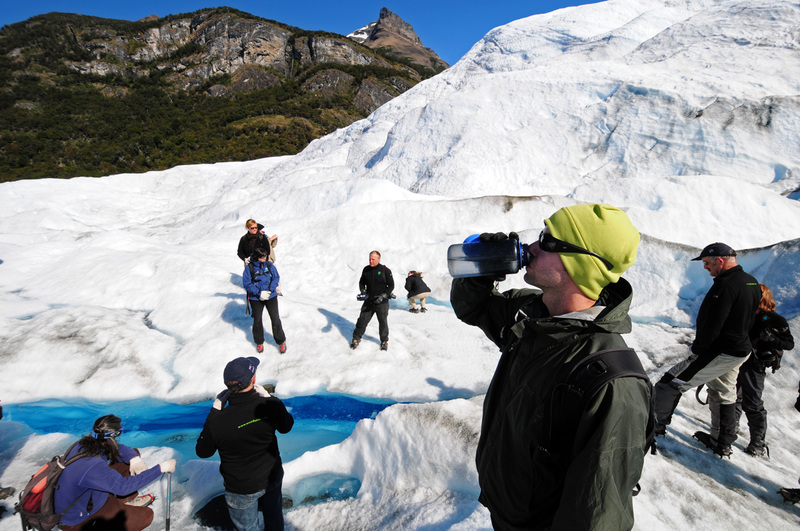 The trip included a boat ride to the glacier, then a short hike on the ice with crampons. Our guide, a Last of the Mohicans/Daniel Day Lewis look-alike, led us up and over the ice and gave us a lesson on glaciology. A couple large chunks of ice calved off as we went by on the boat, although it’s one of a few glaciers in the world that isn’t technically receding. Back in town we stayed at a cool little two bedroom bungalow/apartment for a few nights and made ourselves right at home. Jesse cooked us up some tasty spaghetti with sausage and mushrooms, he’s quite the cook. It was so much fun for us to have friends from home down to visit AND a car too! 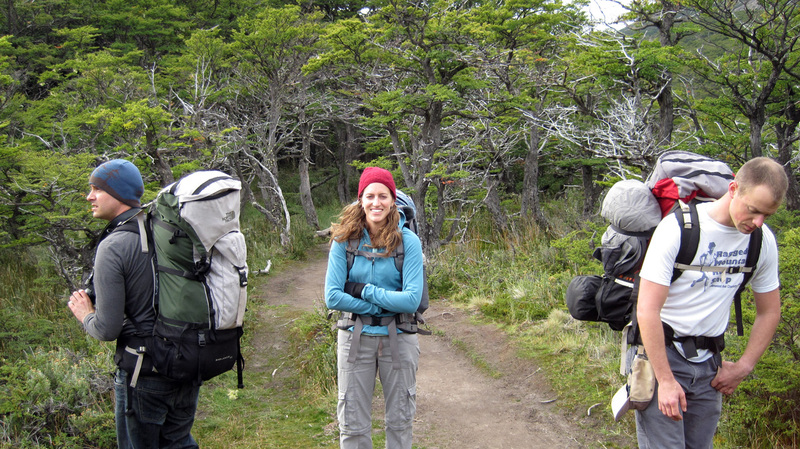 Caroline's Uncle Louis happened to be trekking in Patagonia too. 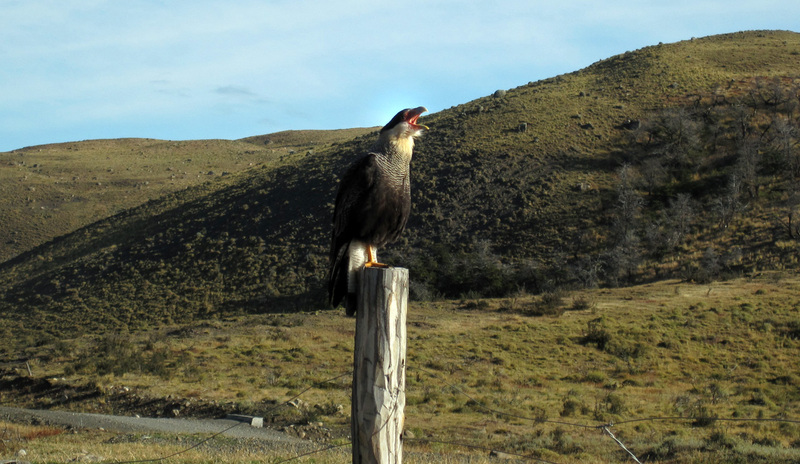 He treated us all to a delicious dinner in El Calafate, one of the best meals of the trip! Thanks again Louis!! 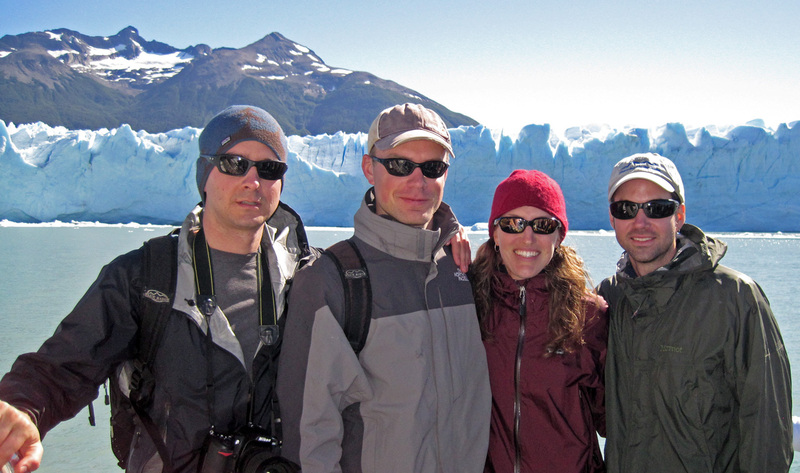 On the boat to Perito Moreno Glacier near El Calafate. On a boat! We had a great day trip again with perfect weather. 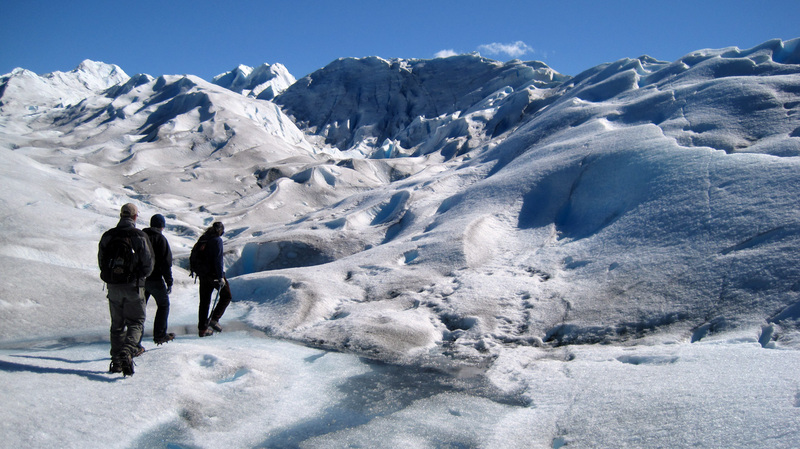 Hiking out to the massive glacier. Our guide (I will find you!) led us out onto the ice. 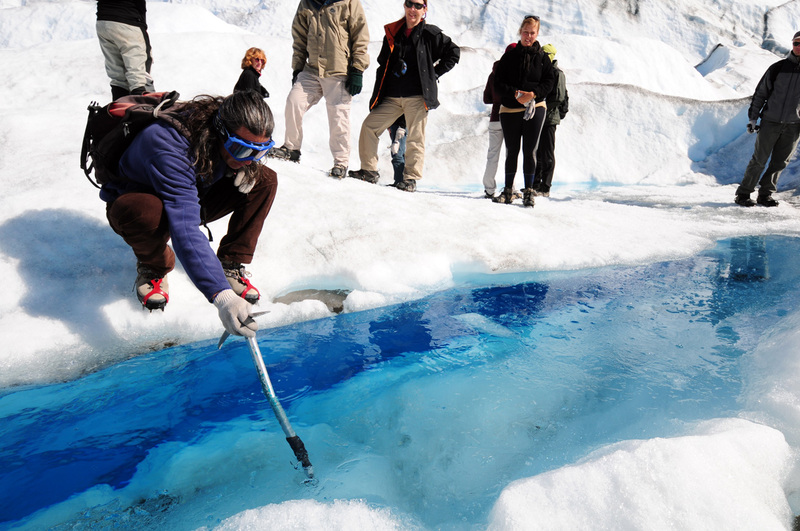 A deep water filled fissure in the glacier. By Jesse. As good as water gets. By Jesse. We're having a pretty good time down here, as you can tell. By Jesse. What's this? 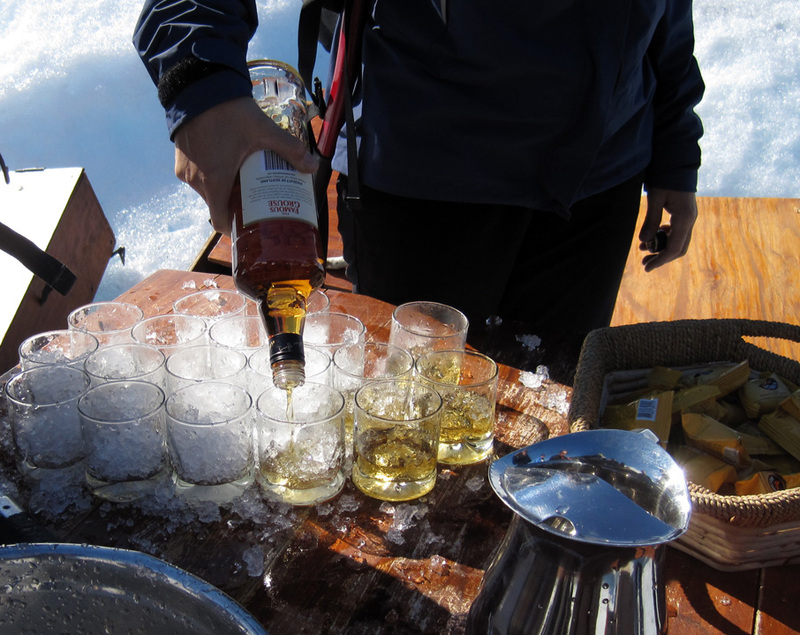 Glacier ice and whiskey at the end of the walk! We actually brought our own bottle of Gentleman and a few glasses just in case. Another fine day with friends. Jesse walks out to the point for a better perspective and sets up this nice shot. 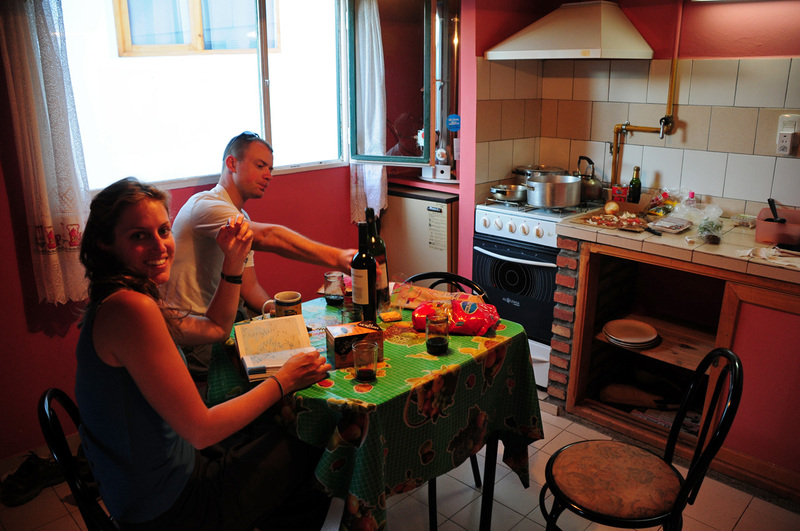 Relaxing with wine and cheese at our little apartment in El Calafate. By Jesse. 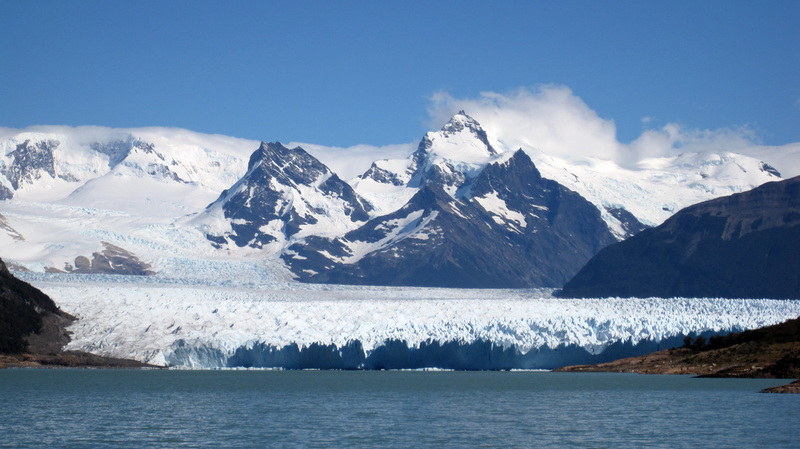 Our next stop was north to El Chalten, Argentina’s newest town, founded in 1985. Apparently they have a cemetery all plotted out, but it’s empty since nobody has passed away yet! 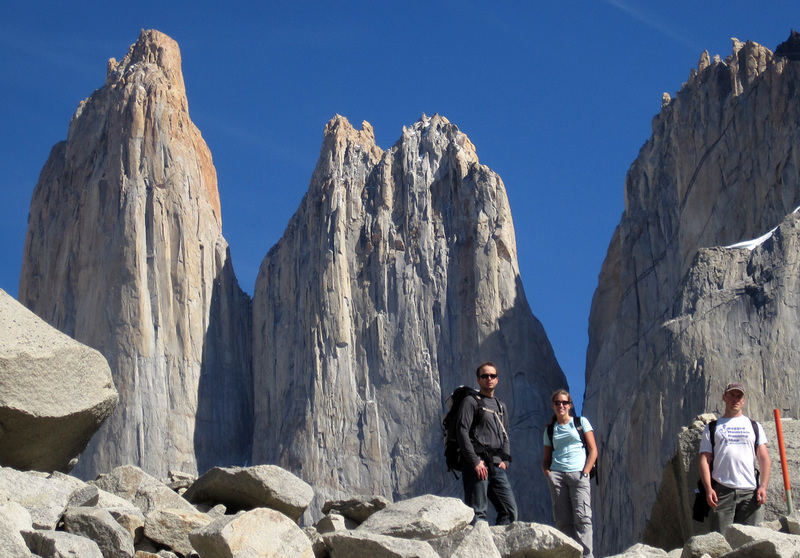 On our first day we stored all our extra stuff at a hostel and set about trekking around the Fitz Roy region. We stocked up on food (mostly tuna, crackers, and snacks) rented tents and headed off for the three day/two night hike. The trails were beautiful, well marked and maintained, and the weather was stable for the first two days – day three was windy and rainy though. 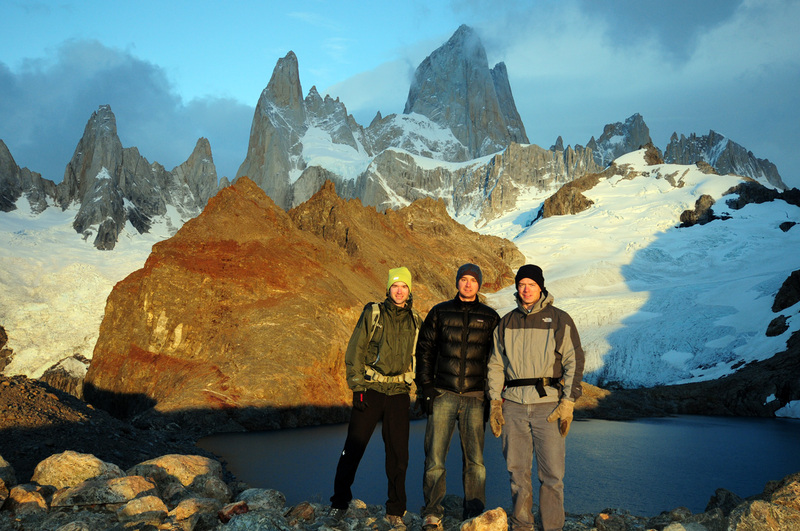 The guys and I got up really early on day two to hike up to a lake and viewpoint in front of Fitz Roy. We started hiking at 5:30am and got up there an hour later, a little ahead of schedule. Sadly it took the sun another hour to rise! We were all freezing, but once the sun came up we got some awesome photos and warmed up quickly. Caro was feeling a little under the weather, and slept in that day. Fortunately, we spent the second night camped at a refugio that offered a nice warm wood stove and hearty meals too. After that hike we headed back to Chalten where we relaxed and enjoyed some more great restaurants (the best steak of the trip!) 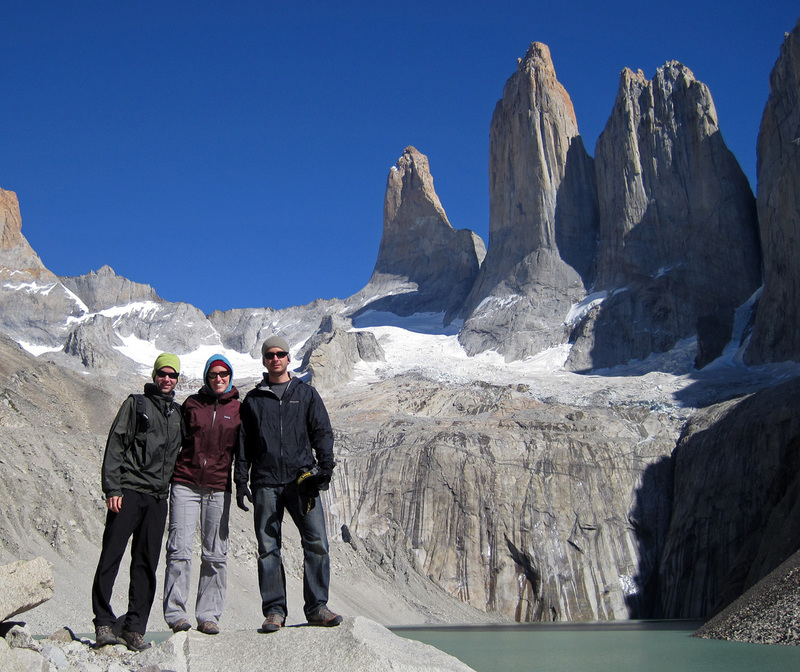 and a final day hike to see Cerro Torre. 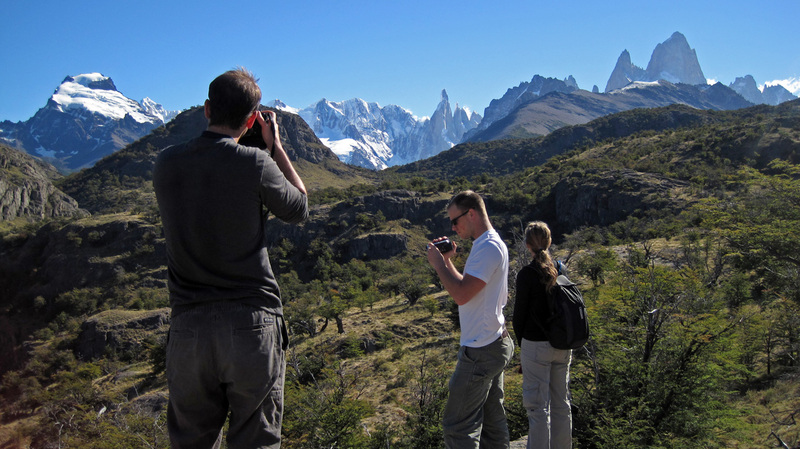 The Cerro Torre hike was an easy two hour jaunt up a valley just outside of town. It was clear at first but then clouded up as we got closer to the lake and the mountains. 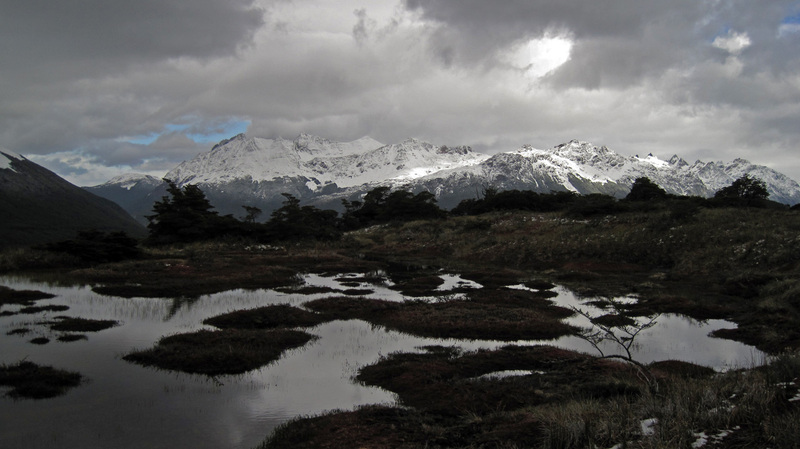 As soon as we got to the viewpoint, as if on cue, the clouds lifted and we were blessed with a perfect view of the imposing Cerro Torre straight ahead. 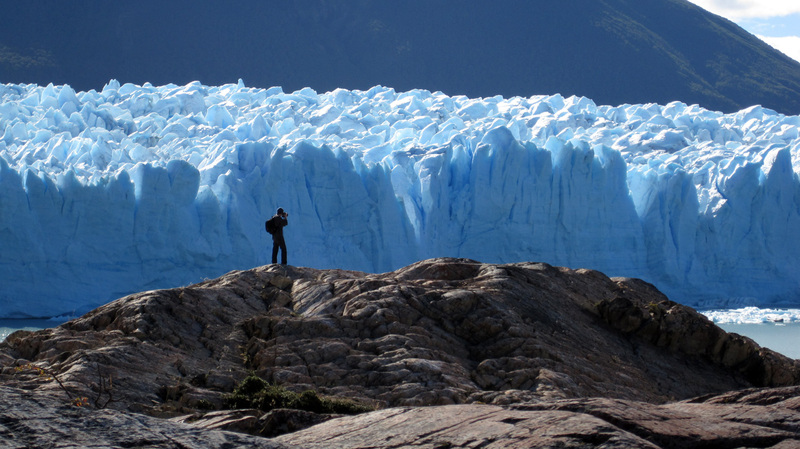 It was a nice finale to the Patagonian adventure. 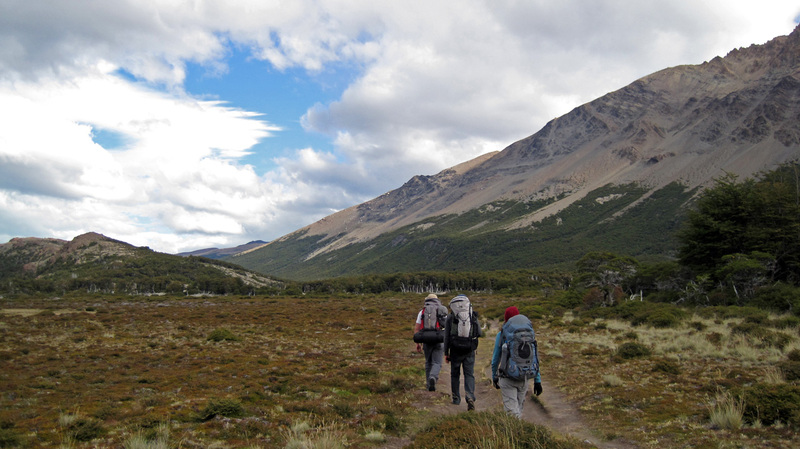 Day 1 of our hike around Fitz Roy near El Chalten. Coming into camp on day 1. 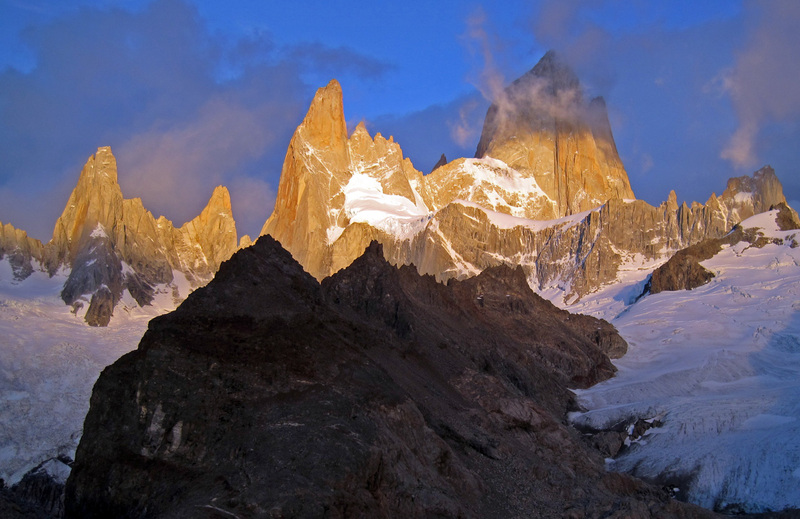 A spectacular sunrise hits the mountains around Fitz Roy. Getting up at 5am paid off big time. The three frozen amigos thawing out in the sun. Super views with snow in the background on the hike down. Anything but tuna and crackers! 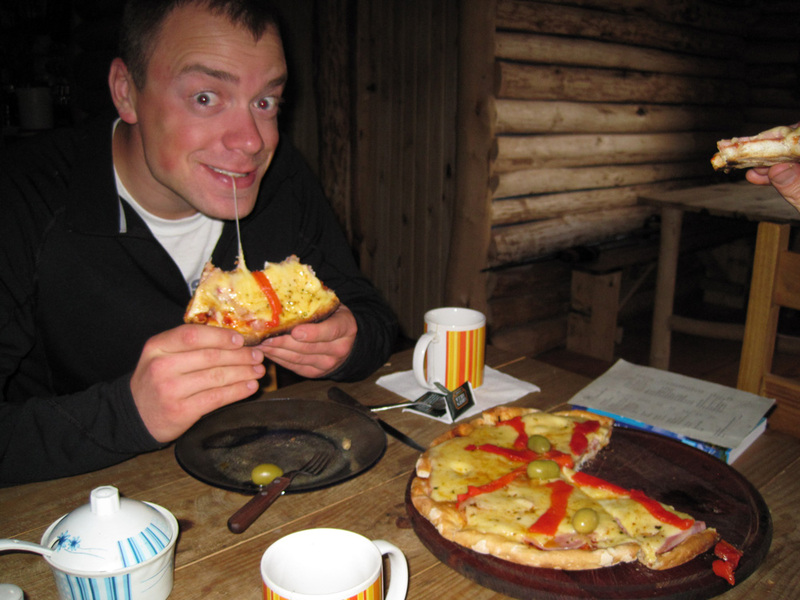 Steve enjoys a decent pizza at the refugio. 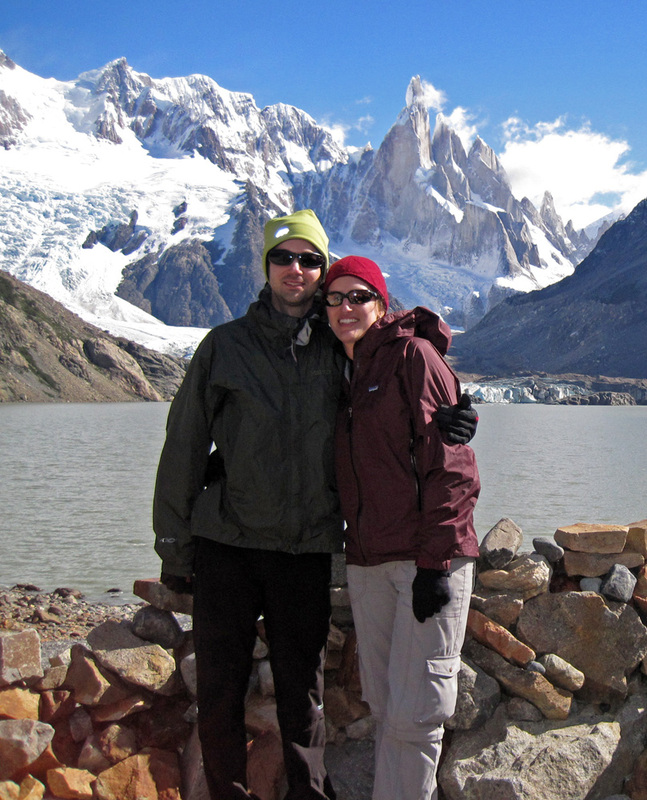 The hike to Cerro Torre was a favorite. Looking out over the Laguna to Cerro Torre. 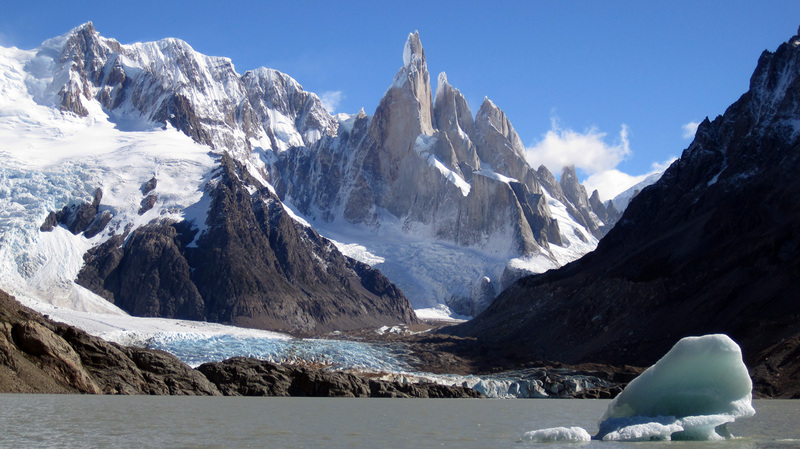 And we thought Patagonia would have terrible weather... A rare shot with both Cerro Torre and Fitz Roy visible. Thank you Jesse and Steve for making the long trip south! It couldn’t have been better. If you enjoyed our photos of the trip, wait until you see Jesse’s, they’re stunning! Check them out here. Wow!! The best we can do is go see North Face today at the cinema. What an awesome adventure. It was great to see you all again. See you when ya’ll get back. Fantastic stuff guys! But… on a boat AGAIN without a nautical themed pashmina afghan?!??!?!?? ?